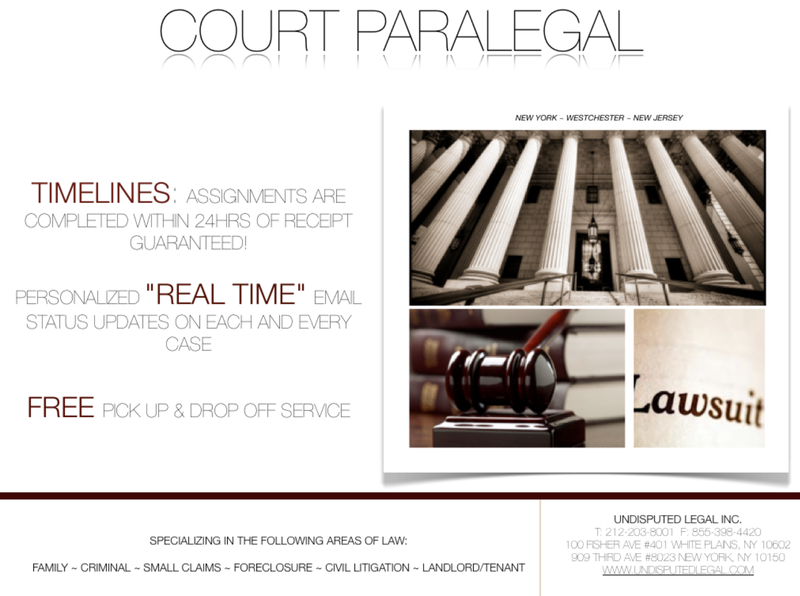 New York City Paralegals | Undisputed Legal Inc.
Posts tagged with "New York City Paralegals"
the court for other accommodations. This entry was posted in Law, Legal, Legal Material, Undisputed Legal Inc and tagged Acceptable Forms of Payment, bronx court service, brooklyn court service, BROOKLYN FAMILY COURT, Brooklyn Family Court - Court Service, Calendar Calls, Case Tracking, Civil Court Filing Fees, Court Fee, Court Filing, Court Filing Fee’s, Court Forms, Court Service, District Court Fee Schedule, Document Retrieval, Filing Fee’s, Filing Motions, filing orders to show cause, filing RJI, Fillable Court Forms, Kings County Family Court, manhattan court service, nassau county court service, New York City Court Service, New York City Paralegals, New York Court Filing, New York Court Service, New York Filing, New York Paralegal, New York State Court Forms, NY Court Service, NYC Court Service, paralegal, Purchase index Numbers, Request For Judicial Intervention Form, RJI Form, So-Order Subpoenas, staten island court service, suffolk county court service, Supreme Court Filing Fee, United States District Court Fee, westchester court service on December 8, 2014 by Customer Service. This entry was posted in Law, Legal, Legal Material, Undisputed Legal Inc and tagged Acceptable Forms of Payment, bronx court service, BROOKLYN CIVIK COURT, brooklyn civil court, brooklyn civil court - court service, brooklyn civil court address/directions, brooklyn civil court service, brooklyn court service, Calendar Calls, Case Tracking, Civil Court Filing Fees, Court Fee, Court Filing, Court Filing Fee’s, Court Forms, Court Service, District Court Fee Schedule, Document Retrieval, Filing Fee’s, Filing Motions, filing orders to show cause, filing RJI, Fillable Court Forms, manhattan court service, nassau county court service, New York City Court Service, New York City Paralegals, New York Court Filing, New York Court Service, New York Filing, New York Paralegal, New York State Court Forms, NY Court Service, NYC Court Service, paralegal, Purchase index Numbers, Request For Judicial Intervention Form, RJI Form, So-Order Subpoenas, staten island court service, suffolk county court service, Supreme Court Filing Fee, United States District Court Fee, westchester court service on December 8, 2014 by Customer Service. This entry was posted in Law, Legal, Legal Material, Undisputed Legal Inc and tagged Acceptable Forms of Payment, bronx court service, brooklyn court service, Brooklyn Supreme Court - Court Serivce, Brooklyn Supreme Court Directions, Calendar Calls, Case Tracking, Civil Court Filing Fees, Court Fee, Court Filing, Court Filing Fee’s, Court Forms, Court Service, Court Service - Kings County, Directions Kings County Supreme Court, District Court Fee Schedule, Document Retrieval, Filing Fee’s, Filing Motions, filing orders to show cause, filing RJI, Fillable Court Forms, Kings County - Court Service, Kings County Supreme Court Address & Directions, manhattan court service, nassau county court service, New York City Court Service, New York City Paralegals, New York Court Filing, New York Court Service, New York Filing, New York Paralegal, New York State Court Forms, NY Court Service, NYC Court Service, paralegal, Purchase index Numbers, Request For Judicial Intervention Form, RJI Form, So-Order Subpoenas, staten island court service, suffolk county court service, Supreme Court Filing Fee, United States District Court Fee, westchester court service on December 8, 2014 by Customer Service. Purchase Index Number, Court Filing, Document Retrieval, Call Now For A Free Quote! On a daily basis we service all Federal, State, Civil, Criminal, Matrimonial, Family, Surrogates and District Courts. Whether it be simple filings, submittals, so-ordering subpoena’s, submitting and tracking orders to show cause for signature, writs, appeals, adjournments, document retrievals, case tracking for decisions, recordings, searches, d/b/a’s, judgments, etc., we are the company for you. Our paralegals are highly experienced in the following fields of law: foreclosure, civil litigation, matrimonial, family, criminal, small claims, landlord tenant, wills & estates, mortgage and land records, judgments and bankruptcy. This entry was posted in Law, Legal, Legal Material and tagged Acceptable Forms of Payment, bronx court service, brooklyn court service, Calendar Calls, Case Tracking, Civil Court Filing Fees, Court Fee, Court Filing, Court Filing Fee’s, Court Forms, Court Service, District Court Fee Schedule, Document Retrieval, Filing Fee’s, Filing Motions, filing orders to show cause, filing RJI, Fillable Court Forms, manhattan court service, nassau county court service, New York City Court Service, New York City Paralegals, New York Court Filing, New York Court Service, New York Filing, New York Paralegal, New York State Court Forms, NY Court Service, NYC Court Service, paralegal, Purchase index Numbers, Request For Judicial Intervention Form, RJI Form, So-Order Subpoenas, staten island court service, suffolk county court service, Supreme Court Filing Fee, United States District Court Fee, westchester court service on December 1, 2014 by Customer Service. This entry was posted in Law, Legal, Legal Material, News and tagged Acceptable Forms of Payment, bronx court service, brooklyn court service, Calendar Calls, Case Tracking, Civil Court Filing Fees, Court Fee, Court Filing, Court Filing Fee’s, Court Forms, Court Service, Court Service Paralegal, District Court Fee Schedule, Document Retrieval, Filing Fee’s, Filing Motions, filing orders to show cause, filing RJI, Fillable Court Forms, manhattan court service, nassau county court service, New York City Court Service, New York City Paralegals, New York Court Filing, New York Court Service, New York Filing, New York Paralegal, New York State Court Forms, NY Court Service, NYC Court Service, Purchase index Numbers, Request For Judicial Intervention Form, RJI Form, So-Order Subpoenas, staten island court service, suffolk county court service, Supreme Court Filing Fee, United States District Court Fee, westchester court service on November 26, 2014 by Customer Service. Do You Need Help Collecting Money That Is Owed To You? This entry was posted in Law, Legal, Legal Material and tagged Acceptable Forms of Payment, bronx court service, brooklyn court service, Calendar Calls, Case Tracking, Civil Court Filing Fees, Court Fee, Court Filing, Court Filing Fee’s, Court Forms, Court Service, District Court Fee Schedule, Document Retrieval, File Lien, Filing Fee’s, Filing Motions, filing orders to show cause, filing RJI, Fillable Court Forms, how to enforce a money judgment, manhattan court service, money judgement, nassau county court service, New York City Court Service, New York City Paralegals, New York Court Filing, New York Court Service, New York Filing, New York Paralegal, New York State Court Forms, NY Court Service, NYC Court Service, paralegal, Purchase index Numbers, Request For Judicial Intervention Form, RJI Form, So-Order Subpoenas, staten island court service, suffolk county court service, Supreme Court Filing Fee, United States District Court Fee, westchester court service on September 30, 2014 by Customer Service. Do You Need Help Filing Your Documents in Court? This entry was posted in Law, Legal, Legal Material and tagged Acceptable Forms of Payment, Calendar Calls, Case Tracking, Civil Court Filing Fees, Court Fee, Court Filing, Court Filing Fee’s, Court Forms, Court Service, District Court Fee Schedule, Document Retrieval, Filing Fee’s, Fillable Court Forms, New York City Court Service, New York City Paralegals, New York Court Filing, New York Court Service, New York Filing, New York Paralegal, New York State Court Forms, NY Court Service, NYC Court Service, paralegal, Request For Judicial Intervention Form, RJI Form, Supreme Court Filing Fee, United States District Court Fee on August 12, 2014 by Customer Service.